Does your GE Dishwasher have Blinking Lights or Beeping Sounds? Most GE Dishwashers that have a control panel can display blinking lights or have audible beeping noises. The blinking lights and the beeping sounds indicate certain issues with the many model number GE dishwashers. There is a common way to reset most GE dishwashers. Find the information you need below to reset the dishwasher and stop the lights from flashing. – If you have blinking lights on the display panel of your GE dishwasher: Try pressing the START/RESET button. If this does not reset the dishwasher and stop the blinking lights or beeping sounds, then simply unplug or remove power to the dishwasher for 10 minutes. Plug the dishwasher back in and it should be reset and ready to begin a wash cycle. – When your GE dishwasher wash cycle will not start and all the lights are on, the START/RESET button may have been pressed more than once. Pressing the button once starts the cycle. Pressing the button twice resets the dishwasher. – If ALL the lights are either blinking or constantly ON, the START button on the dishwashers display was accidentally PRESSED MORE THAN ONCE. (Only press the START button 1 time when you begin a wash cycle) To stop the flashing lights or steady ON lights, press the START button 1 more time to resume normal operation. This should get the dishwasher working again. NOTE: The GE dishwasher wash cycle can always be canceled by pressing the START/RESET button. – If there is a power failure, the START button may blink when the power comes back ON. Pressing the START button once again should reset the dishwasher. Once the START/RESET button is selected, the drain pump will remove any residual water left over in the bottom of the dishwasher. When the drain pump is pumping out the leftover water, the START/RESET button will blink. Wait for the dishwasher to remove any leftover water. After the dishwasher removes the water, it should be back to normal and you can begin a normal wash cycle. – If you hear a beeping noise every 30 seconds, this means the GE dishwasher door was opened during the cycle. Simply shut the door to continue with the wash cycle. – If the START/RESET button light is Blinking, this means the dishwasher has been reset. The blinking light means the dishwasher is in the process of shutting off. The START/RESET button light will blink for 70-90 seconds. NOTE: This will depend on the model number dishwasher you have. – Blinking lights and beeping sounds can be caused from a power surge. 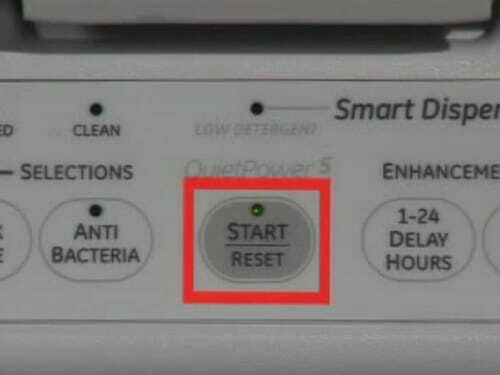 Press the START/RESET button to reset the dishwasher. Wait for 3 minutes and the dishwasher should resume normal operation. If the issue comes back, you can reset the dishwasher by unplugging it for 30 seconds to 10 minutes. Once you plug the dishwasher back in, the dishwasher should resume normal operation. GE dishwasher model numbers starting with GDF/GDT/PDT/CDT/DDT/ADT/ZDT will BEEP when the the control panel is pressed or the START button is pressed. To turn off the control pad sounds simply press the HEATED DRY BUTTON or the POWER DRY BUTTON 5 times in quick succession. Pressing the buttons 5 times will turn off all sounds. For GE dishwasher LCD models that have a display (Models GDT580, CDT725SSF, GDT720SSF) Press the HEATED DRY BUTTON or the POWER DRY BUTTON 7 times in 5 seconds. Pressing the buttons 7 times will stop all beeps and noises. To fully determine why your GE dishwasher is beeping and has flashing lights, you can find your specific GE dishwasher owner’s manual here. 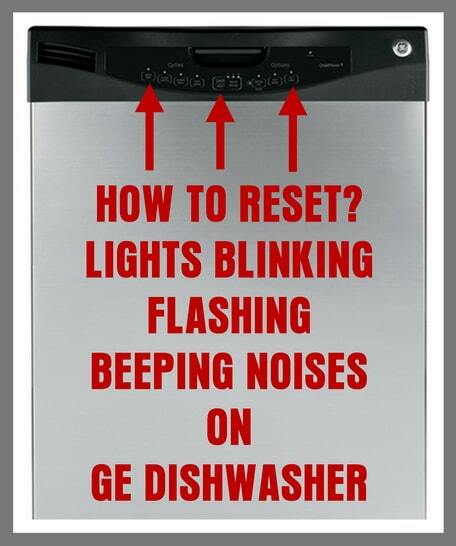 Do you have an issue with your GE dishwasher flashing lights or beeping noises? Please leave your question below and we can assist you in troubleshooting your dishwasher. I have a GE GDT655SSJSS. I’ve tried rapidly pushing the Heated Dry button, as directed in the owners manual and it does exactly nothing. Hello, My dishwasher is beeping 3 times in a row when I try and start to do a load of dishes. I unplugged it once before and it started working again. Now it’s doing it again and unplugging it is not solving the problem like before. I did some research and I think it that it means that the door sensor is not working properly, because the door is completely closed. Is there a way to fix this? Thank you for your help! I have a GE Triclean quite power 1 the normal green light is flashing continuously i have unplugged it and try resetting it as well but unsuccessful. When i lock it it starts making the beeping sound as well and the light still keeps flashing. Can you please advice. I assume control board problem but not sure?? do you recommend repair on this 8 year old unit or get a new one? I also have tried turning off power at circuit breaker for 30secs -10 mins and it doesn’t help. I have 2 lights on (auto & heated on) with a beeping sound every 15 seconds. I obviously can’t open the door either. My #GLD5654VOOCS ge dishwasher is shut and latched but stops working and starts beeping as if door was opened. It was not. Reset it by flipping circuit breaker for 30 secs. It will start working if reopened and shut, but then stops in about 10 mins. and continues to beep as if door was opened.How do i fix this? Ive tried everything I can including powering off at the fuse panel for 10 minutes. 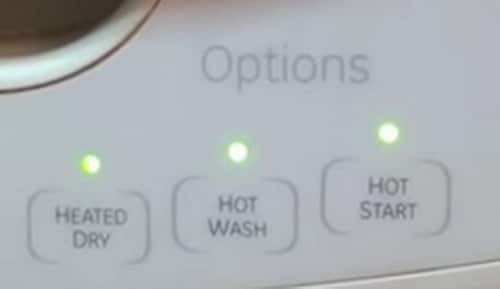 My problem is that the buttons will light up (normal wash and high temp wash lights) but nothing responds to the touch/button push. When I close the door and it latches, it will beep once like it recognizes the latch switch activation. but the buttons still do not work. The other symptom is occasionally the “hight temp” wash light will beep & flash on and off randomly for several minutes. No noticeable patterns to the beeps & flashes. It eventually just stops and all the lights go out. Not sure if it is some thing wrong with the control board or something else. washer is only 5 years old. I have an issue about beeping noises every 15 seconds after the dishwasher runs a cycle. It stops at 73 minute mark that has started washing at 120 minute mark. I opened the door and shut it back and nothing happens. I can’t even activate the reset/start button. My GE Quiet Power Dishwasher 1 GLD4260l00SS flashed the start, delay, heated, hot wash, hot dry and clean buttons once, then the rinse, china, normal and heavy lights once and now it is just making a sounds, but not washing. Like the steam and drain are maybe running? I shut power at the circuit breaker for a few minutes, but it just went right back to the noise when I powered up again. It is not responding to any button I push. Nothing I saw in the manual talked about this flashing sequence. Indicates the dishwasher door was unlatched during the cycle. Close the dishwasher door to resume the cycle. Indicates that the dishwasher has been reset and is in the process of turning off. This light will blink for 75 to 90 seconds, depending on the model. – Other blinking lights or beeping sounds may indicate a problem with the dishwasher caused by power surges. Try pressing the “Start/Reset” pad to reset the dishwasher and wait 2 minutes. If the problem persists, reset (reboot) the dishwasher by turning off power to the unit at the house circuit breaker/fuse box for 30 seconds. Restore power and the dishwasher should function normally. Check the GE Dishwasher Model Number Search to find your manual and fix the issue. Also, this video may help by on YouTube for an unresponsive GE dishwasher display. Check the GE HELP section for Dishwashers here. Next post: LG Washing Machine Error Code dE – How To Clear?